Sarah Richardson. I know you all do, so don't pretend like you don't. Her designs are fabulous, and I'm pretty sure most of us would be happy to have her design a room in our home. Well, here's your chance (GTA readers - sorry everyone else)! 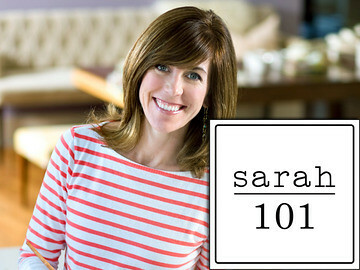 Sarah is currently casting for Season 2 of Sarah 101! To find out more, you can head on over here! For those of you who have been living under a rock, you can head on over here to see all of the rooms that Sarah transformed into stunning spaces during Season 1! Would love to hear if any of my readers responded to the casting call and if they made it. So very exciting - and good luck to those that are submitting their spaces! Really? Ooh, I wish! I don't think our house is in Sarah ready state though... Perhaps if she starts doing one of those stupid-homeowner-starts-a-reno-they-can't-seem-to-finish shows, we could apply. Darn, wish they would come out west! I WISH. Are you submitting? ?